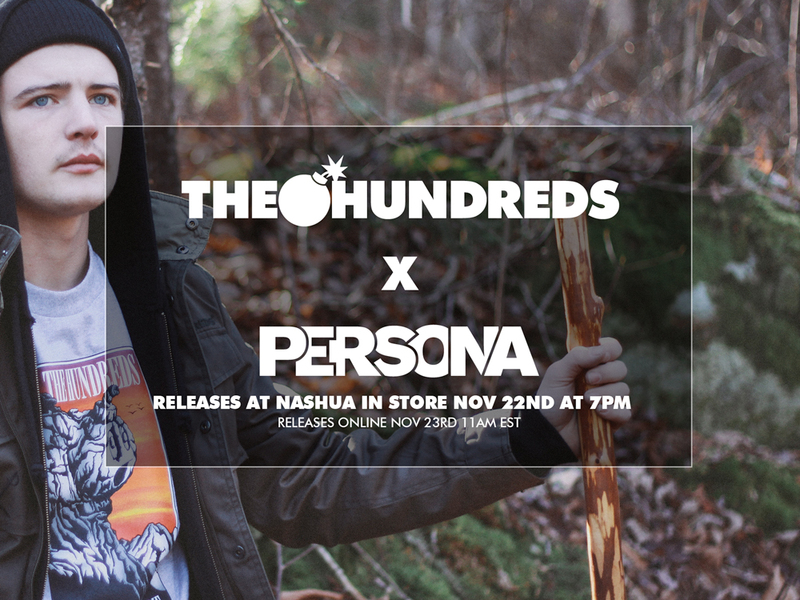 THE HUNDREDS X PERSONA :: "LIVE FREE OR DIE"
The Hundreds is pleased to announce the release of the The Hundreds X Persona “Live Free or Die” collection, available exclusively at Persona’s Nashua (122 Main St., Nashua, NH 03062) flagship location Friday, November 22nd, with a special release party from 7-10 PM, and the following Monday, November 25th at their Lowell location (51 Market St., Lowell, MA 01852). The line will also be distributed via the Persona Online Shop (store.shop-persona.com) beginning Saturday, November 23rd. The “Live Free or Die” collection celebrates The Hundreds’ and Persona’s time-honored history together and introduces two new T-shirt and crewneck offerings – both featuring a custom designed graphic emblazoned across the front and a dual-branded The Hundreds X Persona logo at top back. The custom graphic is inspired by a New Hampshire historical site, “Old Man of the Mountain,” which boasts a series of granite cliff ledges along the Cannon Mountain range resembling the silhouette of a gentleman’s profile. The image integrates the aforementioned landmark, “Old Man of the Mountain,” with The Hundreds’ very own icon, Adam Bomb, to produce the “Adam on the Mountain” graphic embraced in all pieces of this collaboration.